The buying consumer (residential or business) still desires the many benefits that only a water feature can offer. In addition to providing the soothing sounds of water within an artful center piece, the common desire is to create a personal and relaxing environment that is low maintenance. 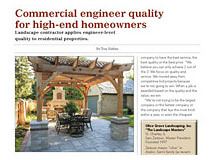 Fortunately, innovations in water feature products make it easier for contractors to meet these market trends. 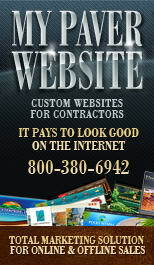 In addition, due to the ease of installation, the man-hours required to install today’s popular features are lower and the earned profit dollar opportunities are higher than ever before. Prior to the days of kits and predrilled basalts, contractors had to build their own water retention basin, find a stone supplier to drill out the rock, figure out the correct diameter of the bore hole, put together the plumbing, and select the proper sized pump to achieve the desired look of the bubbling water. Today, basalts are pre-bored to specification, the basin is included along with the proper plumbing and pump to match up with each kit’s specific needs. So much easier than years ago. 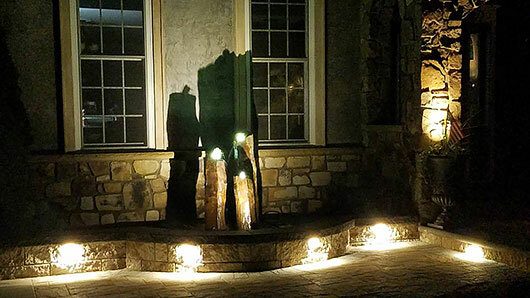 As attractive accent pieces which are also quick to install and fit in limited spaces, basalts have become a best seller available in a wide variety of sizes and styles. 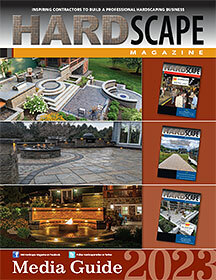 Redesigned spillways are another innovation specifically geared for hardscape applications. 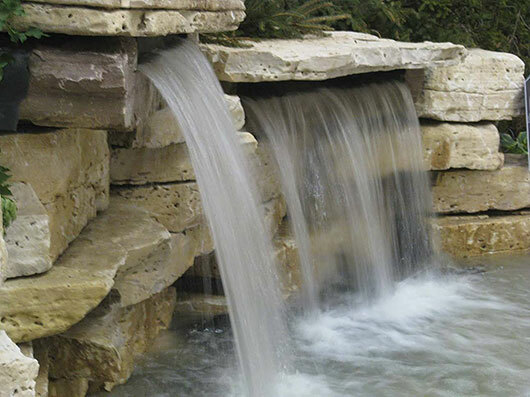 Spillways are designed to be more easily built into walls, outdoor living areas and swimming pools. 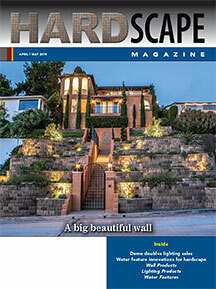 Spillways coming out of decorative walls have been with us for years. The difference is, in the past these features required a lot more preplanning, materials and work to install. The plumbing was traditional “hard walled” pipe and fittings, and the actual spillway had to be constructed on the job site by the contractor using either rock slabs or wall coping, then mortared in place. Achieving even distribution of water over the spillway was a challenge. Installation took a lot of time, and once completed the feature was still vulnerable to cracks and leaks. Plumbing was vulnerable to breaking down. Today, those challenges are just an ugly memory. Plumbing is now done with flexible PVC tubing which can be bent around small curves, requires less fittings, and can withstand harsher climates without failing. The actual spillways are now 1 piece that can be set in place and easily concealed. Stainless steel spillways won’t clog and are impervious to extreme winters and/or summer heat, so callbacks are reduced. Stainless steel spillways come in a variety of lengths and lip sizes to give you the ability to easily choose a single spillway, or stagger a group of spillways. 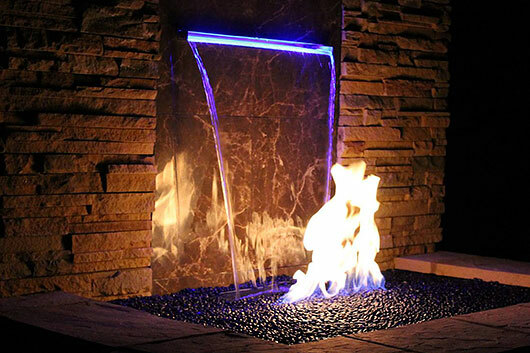 Add remote-control lighting and/or a fire option to provide a wow factor. The most innovative and versatile product in recent years has to be the waterfall diffuser. With a range of flow rates diffusers can be used for waterfalls or spillways. So many applications with this product. Whether the desired look is for a smooth spillway sheet of water, achieved by adding a copper spillway attachment, or a more aggressive waterfall, there are diffusers designed for the application. Today’s diffusers are built to handle the weight of hardscape block stacked directly on the diffuser. Low profile designs make diffusers easy to conceal, and consistent depths ensure all sizes will work together. Multiple units can be connected directly or staggered using flex PVC tubing. Whether the job is big or small, innovative products are available to make your project easier to install and ensure the satisfaction of your valued customers.